Chicken Kabab recipe by Mehtab Sarwar at DesiRecipes.com. 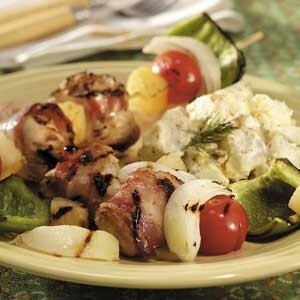 Boneless Chicken pieces grilled with fresh cherry tomatoes, onions and bell pepper. Thread chicken , tomato , onion and capcicum on skewers(use wooden skewers). Arrange kabab in a baking dish. Combine all remaining ingrediants in a small bowl and brush on kababs along with oil. Put into a preheat oven for 40-45 min or until chicken and vegtables are cooked.